This book answers all the tough questions libertarians get from statists, and is perfect for ripping apart purported justifications for the state and common myths about libertarianism. In non-technical terms, the libertarian is simply someone who is against the use of force against peaceful people in civil society. You would think that this would be a universally accepted idea, but to believe in government as we know it is to be at odds with this idea. 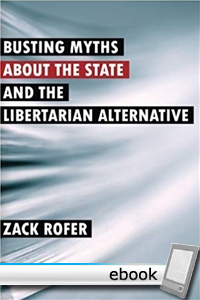 There are many popular myths that are used to try to justify the existence of the state, and also many popular myths about libertarianism and the free market. This book explodes both sets of myths, and is both a primer for those taking a first look at these topics, as well as a tool for libertarians looking to sharpen their advocacy. What Is The “Free Market”? Myth #14: Libertarians Are Utopian! Myth #15: It’s Every Man For Himself! Myth #16: Libertarianism = Chaos! Myth #17: We’d Be Defenseless! Myth #18: There Goes The Environment! Myth #19: Somalia Disproves The Case For Libertarianism! Myth #20: Libertarians Are Shills For The Powerful! Myth #21: Libertarians Don’t Care About The Poor! Myth #22: Libertarians Are Pro-Prostitution And Pro-Narcotics! Myth #23: If It’s So Good, Then Why Hasn’t It Ever Been Tried? Myth #24: Libertarianism Is A Futile Endeavor! VI. Why Does It Matter?